This is one of the first science arts pieces that really switched me on. 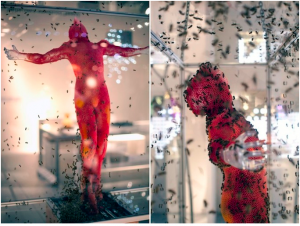 Its called Unbearable Lightness by Dutch designer Tomáš Gabzdil staring 40,000 bees and a honeycomb sculpture of a martyred Jesus Christ. ” Industrious bees created a honeycomb skin over the laser sintered framework, before filling each cell with honey they produce. Next, the bees worked hard to remove the honey from the cells only to return it to their own beehive, cleaning the figure and restoring the wax cells to their original state. Gabzdil made the honeycomb a red-orange color to symbolize the cross.